We aim to provide a solution to help all educational establishments fulfil their statutory duty regarding careers guidance and inspiration. Young Chamber excels because we are able to tap into our strong and supportive Chamber membership of hundreds of businesses in Dorset, across all sectors and of all shapes and sizes, to bring the experiences of individuals – from trainees to MDs – into the classroom. The role of our dedicated Young Chamber Coordinator is to facilitate and promote the involvement of businesses and business people with schools who have joined Young Chamber. Finally, there has never been a greater need or a better time for schools to embrace the enthusiastic contribution of businesses in their classrooms. The launch of the Government’s Industrial Strategy and Careers Strategy in late 2017, supported by the Government-backed Careers and Enterprise Company launched in Dorset in October 2017, means that this level of businesses engagement by schools and colleges is no longer a ‘nice to have’, but a new standard every school or college should be offering. Needless to say, schools and colleges who are part of Young Chamber are already giving their students a huge advantage in this respect. To find out more about sponsoring a school or the Young Chamber programme, see our School Sponsor Benefits Page. Our dedicated Young Chamber Coordinator works five days a week through term time to provide opportunities and activities to schools, organised alongside Dorset businesses. Businesses are invited to sponsor a school’s Young Chamber Membership. While we naturally encourage the school and sponsor to build a relationship and for sponsors to be actively involved with the school, Young Chamber does not stop there; it also unlocks the potential for schools / colleges to have talks, visits and events, etc. organised on their behalf by our Coordinator, from other Dorset Chamber members from a wide variety of sectors. We are always looking to speak with new businesses who would like to be involved with the delivery of the programme. Please see Benefits for interactive businesses. Young Chamber supports the development of crucial interpersonal skills for your young people to prepare them for work, whilst offering insights into possible careers. This is facilitated through organised visits to businesses; inspirational talks; supporting mock interview and careers fair events by sourcing companies where there may be a sector gap. There are additional options to provide workshops on CV writing and job applications, preparing for a job interview and exploring post-16 options. 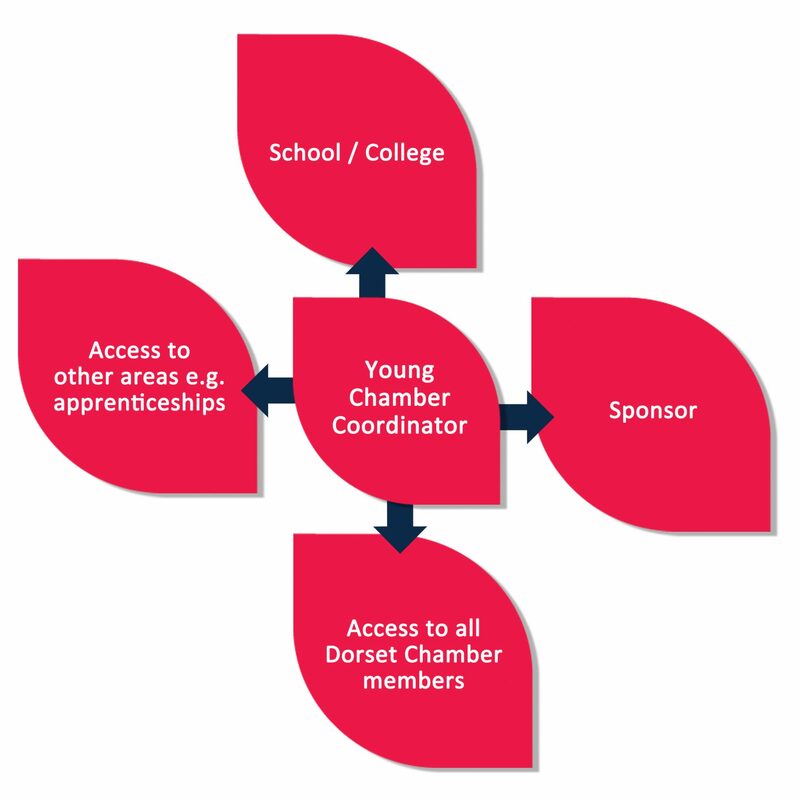 In addition, schools / colleges are offered the opportunity for teachers / staff to spend time in industry (sourced and coordinated through Young Chamber); to receive signposting to apprenticeships* through our involvement with key partners in this areas and support of an Apprenticeship Ambassador scheme; tailored help with Governor recruitment as required; and facilitated development of strategic links with local businesses in defined sectors. *from Jan 2018 schools are required to provide access for other Higher Education and Apprenticeship providers to present students with options. With a large bank of high quality businesses committed to working with schools, we provide a unique opportunity for establishing partnerships between education and business. We can also help employers to develop a greater understanding of young people. Young Chamber complements the good work already taking place in schools / colleges and directly supports an increase in positive ‘post education destinations’ data and helping to reducing NEETs. We quality assure the Young Chamber programme, tailored for the school or college by insisting all businesses sign a clear code of conduct for working with young people. Safeguarding good practice will be adhered to at all times and young people will always work in groups. After activities have taken place, our Young Chamber Coordinator provides follow up with the students, teachers and employers. 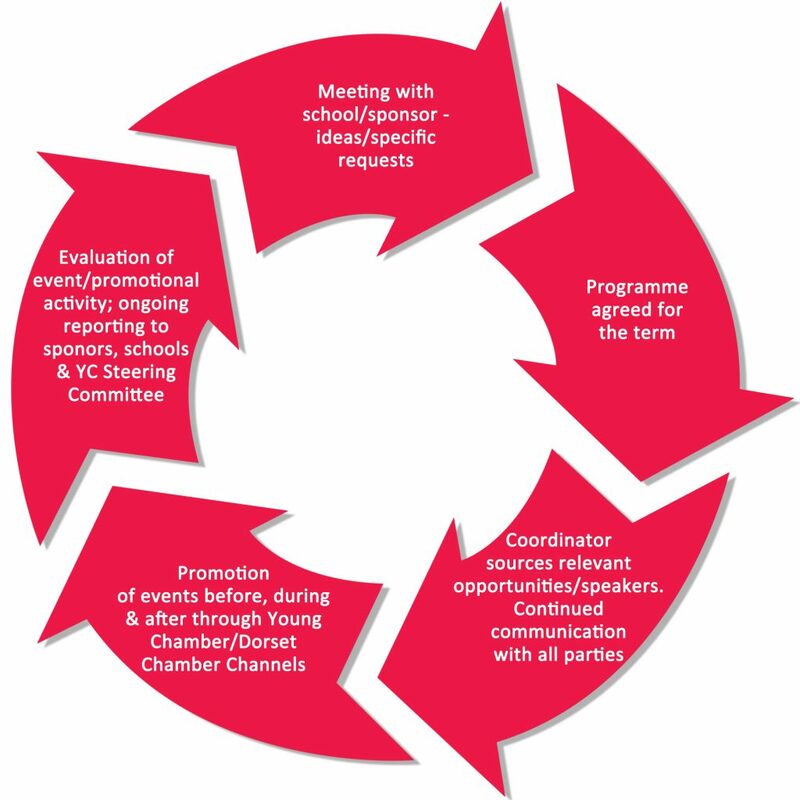 This evaluation is used to help develop and improve the Young Chamber programme as well as providing positive coverage for successful interactions and case studies where relevant.